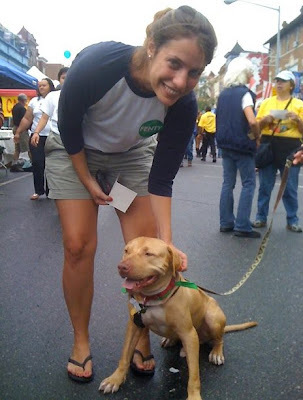 A puppyish foster dog from Lucky Dog Animal Rescue getting his photo taken with a stranger at the at the Adams Morgan festival in Washington, D.C on September 12, 2010. 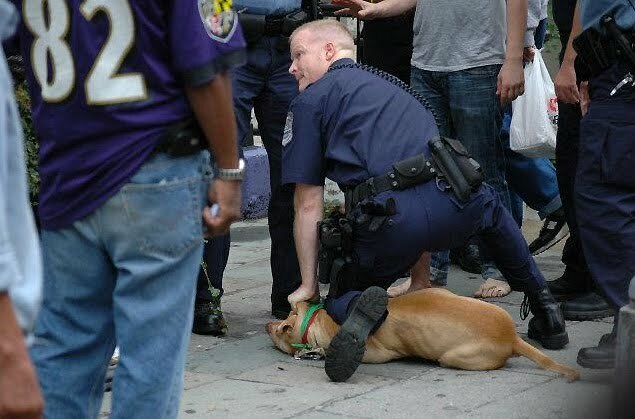 One hour later, DC Officer Scott Fike has the same dog pinned to the ground with his knee pushed into his back. He then hurled the dog down a concrete stairwell, pulled out his weapon and shot the dog dead in front of shocked witnesses. Police had been called when the dog (Parrot) and a second dog got into a fight at the event. The caretakers had broken it up and the trouble was over when police arrived and proceded to execute one of the most stunningly inhumane decisions ever captured in photos during a routine dog call. According to change.org, "The D.C. Metropolitan Police Department "investigated" the incident, as did the Office of Police Complaints. Both recommended that the U.S. Attorney prosecute Officer Fike criminally. Unbelievably, the U.S. Attorney declined. Soon thereafter, the D.C. Metropolitan Police Department dismissed Lucky Dog's complaint against Officer Fike. No action was taken against him." Their petition is asking the Metropolitan Police to "change your policies to prevent future tragedies like Parrot's death and once again instill trust in the police department." 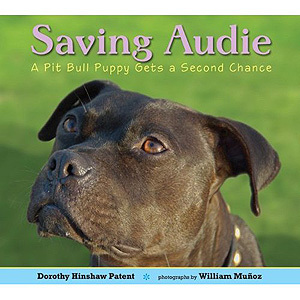 A long history of poor handling of dog incidents by police inspired a new booklet directed at this topic. The U. S. Department of Justice recently published "The Problem of Dog Related Incidents and Encounters," through the Community Oriented Policing Services (COPS). 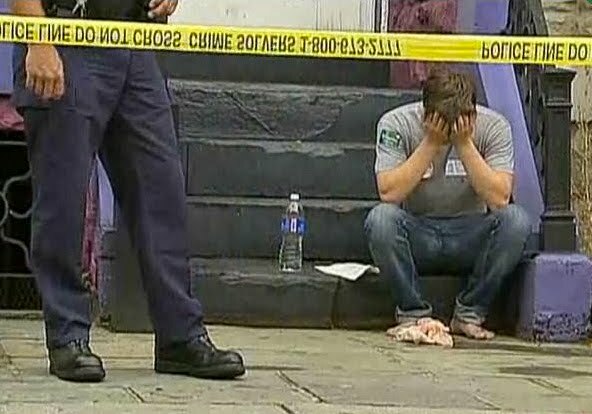 It was created to help police departments examine and improve the same kinds of policies that rolled out into tragedy in DC in 2010. "In the United States, dogs are an integral part of society, which means police engage with dogs quite often in the line of duty. There are a variety of circumstances where a dog could be involved in a police call, and it is critical that police departments not only develop effective departmental strategies advocating for the proper handling of dog-related incidents and encounters, but also proactively create tactical-response strategies, ensuring humane treatment of dogs and safety for the public and officers." According to COPS research, "In most police departments, the majority of shooting incidents involve animals, most frequently dogs. For example, nearly three-fourths of the shooting incidents in Milwaukee from January 2000–September 2002 involved shots fired at dogs, with 44 dogs killed by officers during that period. Information furnished by various California law enforcement agencies indicated that at least one-half of all intentional discharges of a firearm by an officer from 2000–2005 involved animals." Officers who make judgments concerning a dog they encounter based on its presumed breed or physical appearance rather than its behavior. Officers who view a dog running toward them as a threat (the dog could be friendly and merely greeting the officer). Officers who are unaware of leash laws or the laws governing potentially dangerous, dangerous, or vicious dogs in their city or state. Officers who lack knowledge of available animal-welfare resources. Officers who lack skills in handling dogs or reading dog body language. Officers who lack needed canine-communication skills. As police departments play catch-up with humane policies and their obligations to their communities, we continue to urge dog owners to use extreme caution in situations where police may interact with your pets. To quote our legal affairs director Christine Allen in this blog post, written in response to a local shooting of a bull terrier puppy "... if the police knock on your door, don't assume they're going to be friendly to your dog. In general, if they want to enter your house, they need to knock, and announce who they are. Then, they're supposed to wait a reasonable time (or be refused entrance) before they can do anything else. So, if they come to your door, please put your dog away before you open that door. Without commenting on whether or not police officers are truly justified in shooting a pet because they felt threatened, suffice it to say that officers are granted great leeway in the eyes of the law as to whether their actions were "reasonable" depending on the circumstances. In these situations, oftentimes the only evidence you'll have is your word against theirs. I'm sure that we'd all prefer not to even get to that point. So please, as a matter of precaution, put your dogs safely away when you're not around, and before you open the door to any potential non-dog friendly strangers." Please be safe and urge your locale police departments to use the COPS booklet to help educate their officers. We don't want you to be this guy: Parrot's foster dad below, just after the shooting. For more info, Washington Post looked at the incident involving Parrot in this news article. I'm so completely outraged over this. Words cannot explain the heartache I feel for Parrot and his foster dad. Looking at the second picture makes me so sick to my stomach. Parrot had to be so scared and then to be shot to death in front of everyone. All the police officers that were involved should have been fired. Shame on the officers for not caring. Kind of scary since they are the one's who are supposed to protect, but hey let's just pull out our gun and kill a dog in front of a crowd of people and not give a damn. Such heartless people. i am at a loss for words, my heart is broken. dogs are our best friends, so why are WE their worst enemies?this has to stop. its just not right. This strikes terribly close to home, as I was to be at this event with WARL dogs, and we are often just across from Lucky Dog with their guys in their pretty green bandannas. Last minute changes, and I was home when it happened and flooded with emails asking about it. dog and he shot it. The last I heard, he was on "administrative leave". The details of this incident are even more heartbreaking and i just don't want to go there again. Of course, the "cute little dog" started the "fight" which lasted only a few seconds. caught her sneaking around in the roped off "staff and senior volunteers only" area of the kennel at WARL. You try telling the chief of police, sorry you can't go back there. Go to the link and send her an email. I signed the petition and I feel so sad that this occurred. My gosh, that is horrific. I can't say anything beyond that because it would be a bunch of cuss words. Please sign the petition. Do it for our dogs, for the people who had to witness such a horrific event (especially the children), and do it to hold the people who make poor judgment calls accountable for their actions. It is completely unacceptable that Officer Fike engaged in such thoughtless actions. His job is to protect and serve, but all I can think is how he traumatized so many that day who witnessed his unreasonable brutality. I have signed, and I thank Bad Rap and Lucky Dog for opening my eyes to this horrible event. Let's work hard to make it better for future generations of dogs and people. I'm going to hug my dog and cry a bit for Parrot and his foster dad, and then learn what I can do to help the dogs everywhere. This is simply another example of a police officer abusing his power with an animal. It's a disgusting act. The officer became a criminal with this action and a perfectly good dog died. On the other hand, I think we should appreciate and encourage the cops out their who help out dogs, especially picking up strays when they find them on the street. We need to encourage the officers with right intentions and we need to crack down on officers who abuse their power. Though I thought long and hard about how I would write this, I will make this short and concise. I am writing this comment for my own personal satisfaction and hopefully, just maybe, put some of your minds at ease.. I am a peace officer, employed by a San Francisco/Bay Area Sheriff's Office. Please know, as a responsible owner/ambassador of the bully breed and as a peace officer I try to educate my team-mates in the dynamics, myths, and the story of this awesome breed. Every time dispatch says over the radio, "subject has owns a pit bull" or "loose pit bull running in the street" my heart shudders. Not only for the dog, but for the responding officer. I share my bully experiences (good and bad) with my fellow Deputies in hope they will remember my words when responding to such calls involving my beloved breed. Just know, there are officers/deputies out there that are educated, own bullies, and LOVE these damn dogs as much as all of you do! Wow, I can not believe that sick COP did that. I know there are some twisted officers, but that is just cruel. He should be off the force, but hes not. Change does need to happen. Petition signed. This has broken my heart, and I pray for the foster dad. This is sickening. wow.. this is really said, I feel like cops should get training with dogs because they are said to be trained for all situations but apparently that is not the case.. Unfortunately my experiences throughout life starting at the age of six with police agencies such as the RCMP and EPS, behaviour such as this is all to common and consistent amongst its members. And if not doing the same as Fike, a constant display from 80% of police members I';ve encountered in the least threaten and create a hostile environment for the dogs and everyone for that matter. Fix Your Fence - Today! Help for our foster dogs - Thank you! 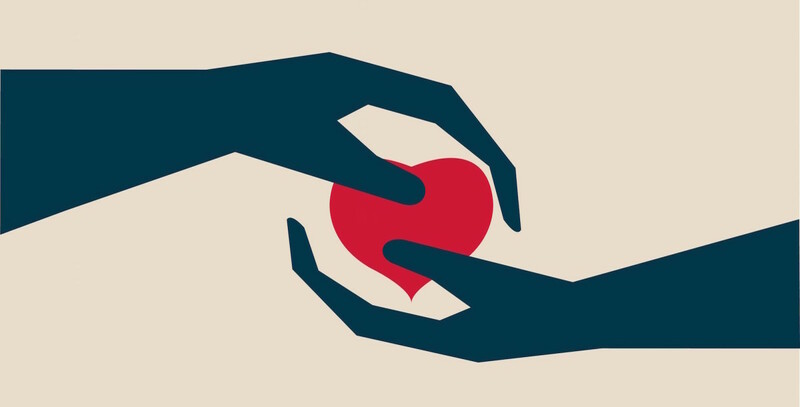 2015 Year-End Wrap Up: Love Wins! Unless sourced to other authors/photographers, all photos and content copyrighted to BADRAP 2011. Simple theme. Powered by Blogger.